The decision to get divorced is one that should be arrived at after all other options have been exhausted. One should only get divorce after concluding that one's marriage is irretrievably broken and there is no hope of a reconciliation. Family counseling has helped many struggling couples in their relationships. One should never have regrets over not having done enough to try to save a marriage. 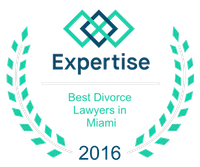 Having said that, if you have concluded that your marriage is over then, before any other decision is made, you should seek the advice of an experienced South Florida family lawyer. Finding the right attorney for your case is the second most important decision that you will make in this process and it is one that can have a lasting impact in your future. Some people invest more time in buying a house or finding a good restaurant than they do in finding an experienced family lawyer, and many times your choice of a divorce attorney can have a greater impact in your life. Be prepared to invest time in finding different alternatives. The more options you develop the better your decision will be. Begin by asking family, friends and co-workers, preferably ones that have been or are going through a divorce. Do a search online. When looking for a family law attorney there are many factors that must be taken into account such as the level of experience your potential attorney has, the hourly rate or potential cost, the comfort level you have with your potential attorney, the geographic location of your potential attorney etc. I do not believe there is such a thing as the best attorney in a particular area. There are attorneys that have a good reputation, have more years of experience and that generally obtain favorable results for their client's; however, that is all relative to a particular client's needs. You do not necessarily need the best attorney in the state with his or her presumably high hourly rate or cost when your case can be resolved with the same level of competency of an experienced family law attorney with less years of experience and presumable a lower hourly rate or cost. As the saying goes, you don't need the best brain surgeon to remove stitches. Experience is generally related to the amount of years an attorney has been practicing. Relevant experience is directly related to the amount of time an attorney devotes to a particular area of practice. You should be looking for an attorney that has experience in the area of family law. The amount of time an attorney has been practicing and the amount of time the attorney dedicates to the area of family law is especially relevant. An attorney that has exclusively practiced in the area of family law will presumably have more experience than one that has a general practice, all other factors being equal. An experienced attorney in the area of family law will almost certainly be more familiar with the latest changes to the laws, local procedures, the judges, the judges staff, local professionals such as mediators, forensic accountants, psychologists and therapists, and the general operation of a family practice. A simple way to find out how long an attorney has been practicing law or his or her standing is to look them up on the Florida Bar Association web site. Most family law attorneys will require an initial deposit for fees and charge an hourly rate. The hourly rate varies somewhat but is generally related to the experience the attorney has in a particular area as well as the market conditions. The best way to get a sense of what is a reasonable and fair hourly rate is to inquire with different attorneys. Generally speaking, attorneys with similar experience charge similar rates. It is important to understand the particular billing practices of each attorney. Ask each attorney to explain his or her fees and billing practices to you until you understand them and do no rely on the language in a contract that you may not take the time to read or understand. Like the selection of any professional, it is important that you feel comfortable with the attorney that is going to represent your interests. You may be spending significant time with him or her and you want to make sure he or she fully understands your concerns. If you are more comfortable in a different language look for an attorney that is fluent in that language and not just that he or she has staff that speak your language. If you require detailed and careful explanation of all details of your case, make sure that the attorney you hire has the time to give you the explanations that you need. The geographical location of your potential attorney is an important factor to consider when choosing an attorney for your family law needs. You will be spending, in some cases, considerable amount of time at your attorney's office. You may also be spending a lot of time in court and the proximity of your attorney to the courthouse is also important since you will be paying for to the attorney's time.